The most important automotive related show to be held in Las Vegas, Nevada is the tuning fan’s heaven, SEMA. This year, one of the appearances to look forward to is a version of Hyundai’s crowd catcher, the Genesis Coupe. That version is actually a racing prepped job done by Gogogear. Something a bit weird in relation to this particular racing prepped Hyundai Genesis Coupe is the fact that according to its makers the performance goal is to produce 330 horsepower and 280 pound-feet of torque from the Genesis’ engine. Which seeing how the Hyundai Genesis’ stock V6 engine produces no less than 306 horsepower this shouldn’t be a problem. The modifications the team over at Gogogear plans to add to boost performance are not very significant. I mean an AEM air intake, a Magnaflow exhaust system and an ARK Performance headers is the sort of stuff you can find in your neighbor’s teenage son’s Civic. The important changes the racing version has to show are those that focus on the reliability of the modded engine and on providing it with proper cooling and lubrication no matter the driving conditions. Now that makes more sense. 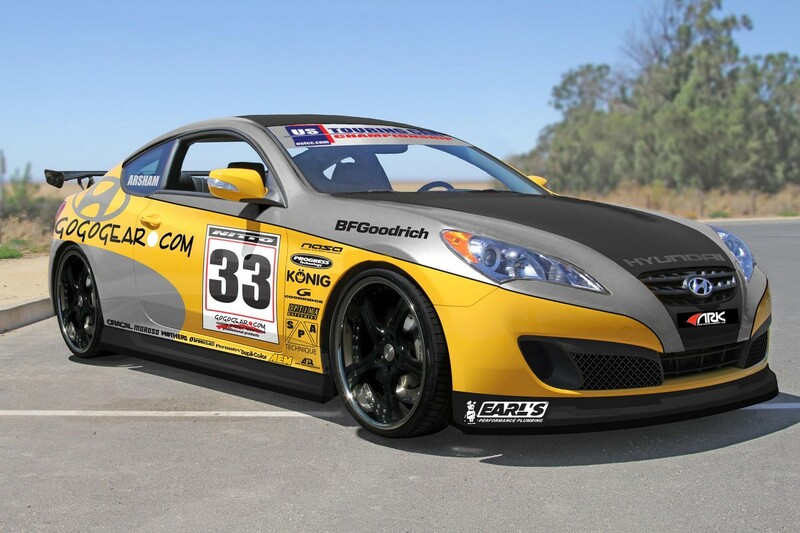 The Hyundai Genesis Coupe racing version that Gogogear will be showing off at SEMA also features major modifications in the handling department as they fitted a Ground Control suspension, StopTech brakes and a new set of tires and wheels destined to make this car stick to the road like it never could before. The SEMA show will be the closest occasion you get to seeing it but not the only one as Hyundai plans to take it racing in the US Touring Car Championship.